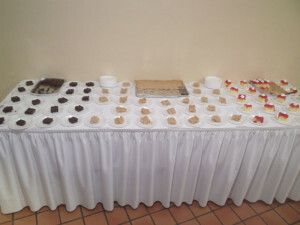 Catering Event Menu, Wedding Catering | Tony & Mary's Catering Inc.
Also included is a professional waitstaff to cover your buffet tables, set-up, maintain, & breakdown the food line, and clear plates, silverware, etc. as your guests finish dining. *Chaffing dishes and coffee pot included for parties of 50 or more people. Tables are not included on any parties..
We strive to give you the utmost in professional service. All wait staff, male and female, will be dressed in uniforms which consist of white oxford shirts with black bow ties, black aprons, black slacks and black shoes.